THE WAUQUIEZ CENTURION IS A SWAN BUILT BY CNB UNDER THE WAUQUIEZ FLAG. 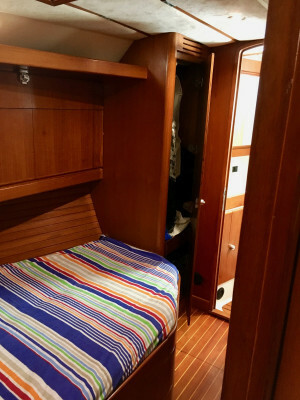 WORKMANSHIP, DESIGN, FINISHING TOUCHES, HULL REINFORCEMENT, SOLID TIMBER INTERIOR ARE IDENTICAL. 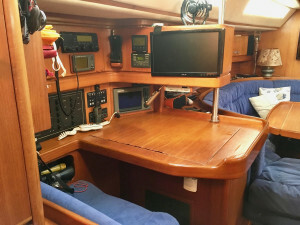 THIS IS NOT A PRODUCTION BOAT BUT AN ABSOLUTE WORK OF ART. 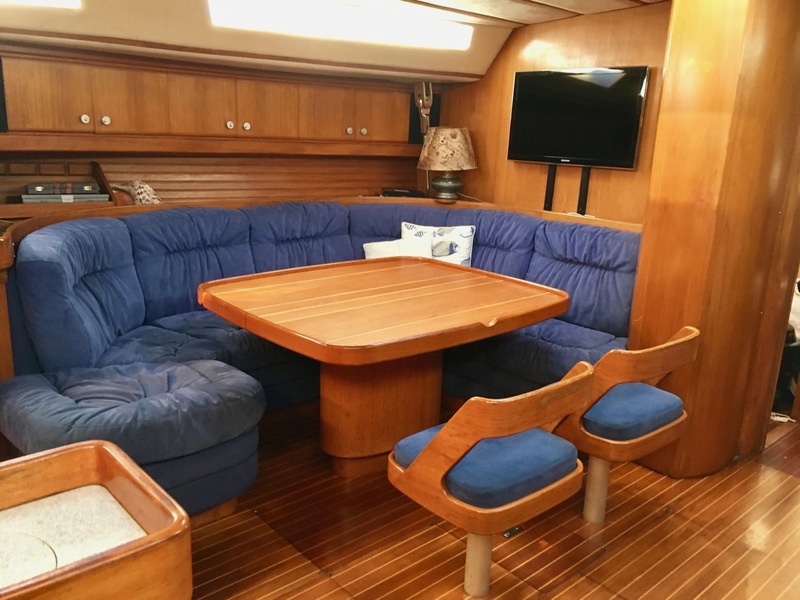 The largest of the Wauquiez range of yachts, the Centurion 61S is built in accordance with the latest technology used for racing yachts with its carbon fiber mast and winged keel, titanium deck gear and carbon fiber deep rudder. Yet this magnificent yacht is also appointed for luxury cruising with teak decks and a lavish interior. 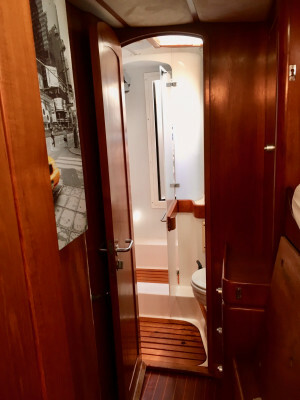 Together, those characteristics are achieved effortlessly in a yacht which grace and power are second to none, and which ambition to sail rapidly and in maximum comfort is matched with her strength and state of the art manufacturing visible in every detail. Used by Wauquiez for as a ‘showcase model’ several boat shows, ‘Noce Sei’ was commissioned by no other than Loic Peyron and Patrick Tabarly! 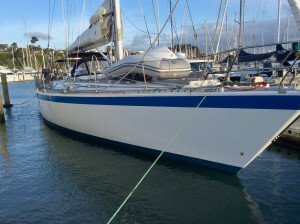 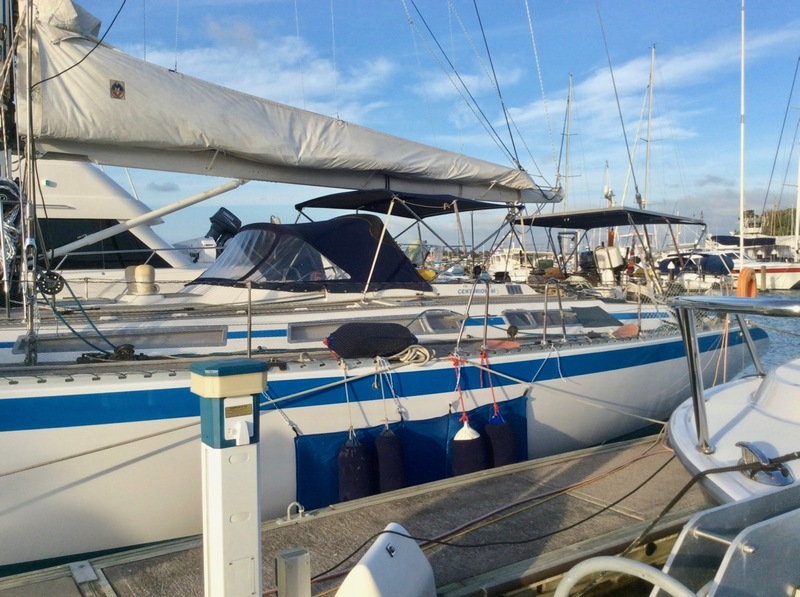 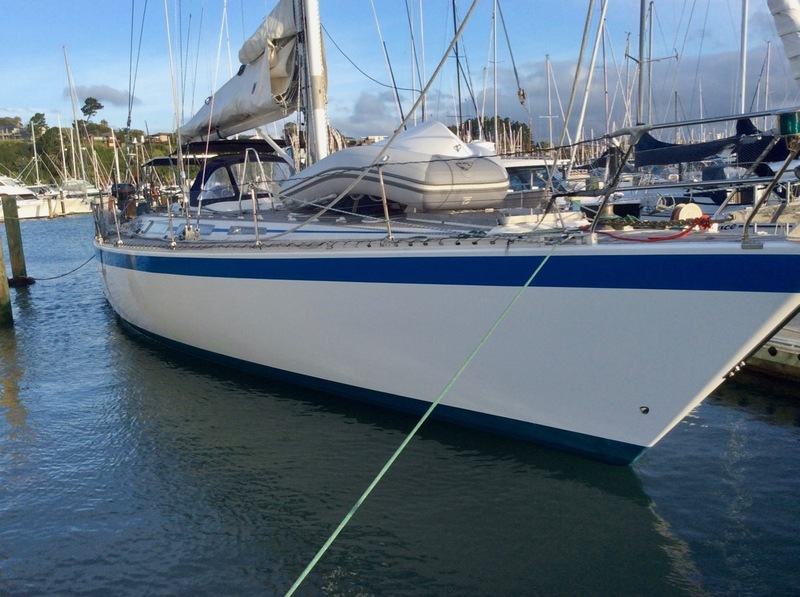 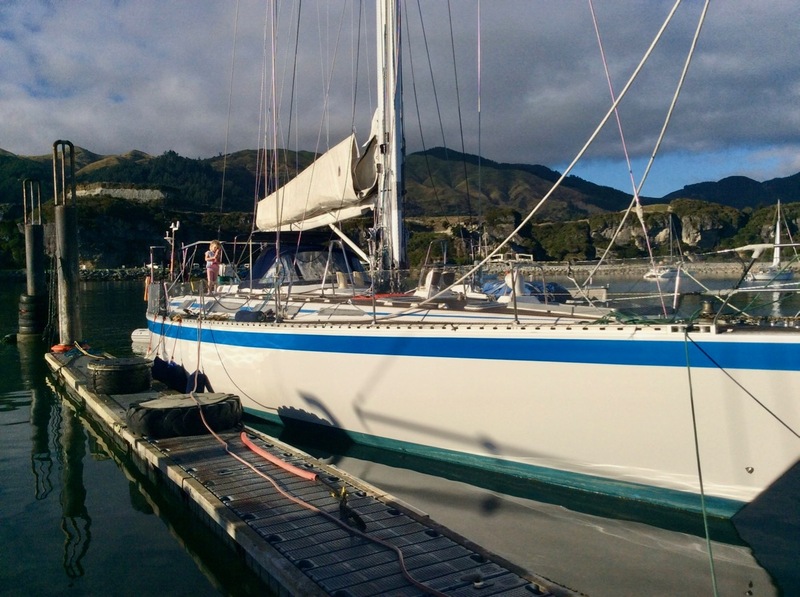 This magnificent vessel has only had two owners since new and was never chartered or rented. The present owner for the past 17 years kept her in beautiful condition, with an extensive refit taking place in 2015, and continual upgrades and as the need arose over the years, as well as religious maintenance as expected for the proud owner of a yacht of this pedigree. In the 61S model of the Centurion 59 on which the design is based, Olivier Provost combined the company’s established reputation for sound construction, excellent appointment and fine quality finish, but increased performance with intelligent modifications to optimize speed with dramatic results without compromising on the vessel’s strength, elegance and comfort. Two feet longer overall that the 59’, this boat boasts a hull rigidity factor multiplied by eight, and weight cut by several tonnes thanks to the Wauquiez-mastered GRP/isophaltic polyester construction formed and cured under vacuum over a core of closed-cell PVC foam (AIREX) 25mm thick with internal structure further strengthened by carbon fiber reinforcement and aluminum stiffening frames. 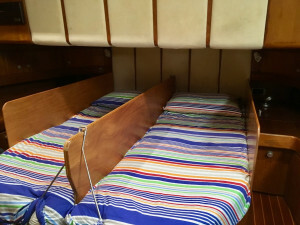 Multiple treatments to prevent osmosis were applied to the hull. 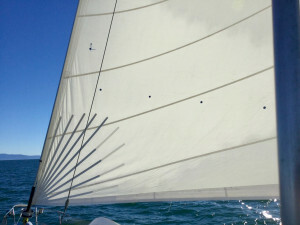 The stern lines have been redrawn to provide less turbulence around the stern and a greater waterline when sailing downwind, so increasing speed. 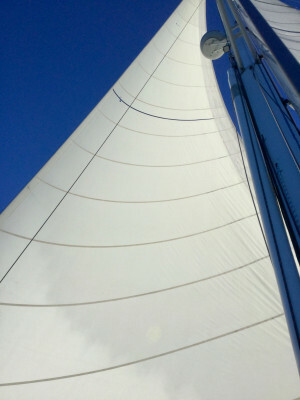 Mast, spinnaker pole and rudder stock are all in carbon fibre / epoxy laminate, vacuum formed and cured, a method of construction involving high tech materials which provides strength for the high-performance conditions and much improved comfort at sea by the marked reduction of rolling and pitching. NAVTEC titanium series hydraulics complex control the backstay, babystays, boom vang and forestay tension. 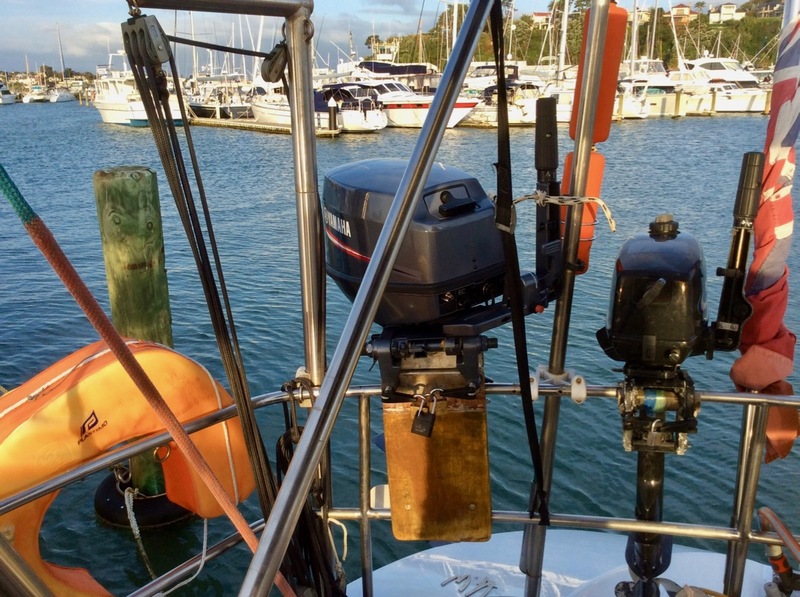 The removable cutter rig provides additional mast stability when needed. 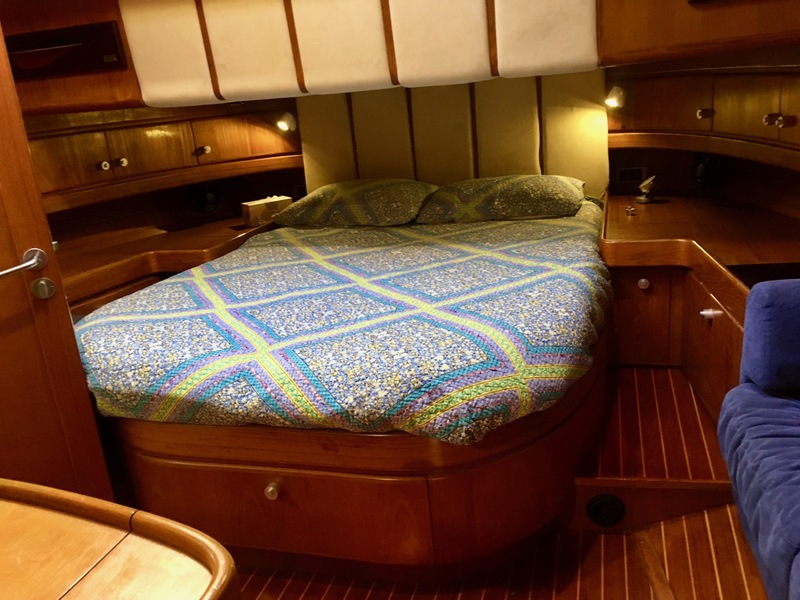 The Centurion 61S is a big yacht, which perfect proportions, trademark leaf shape and beautiful tumble-home. 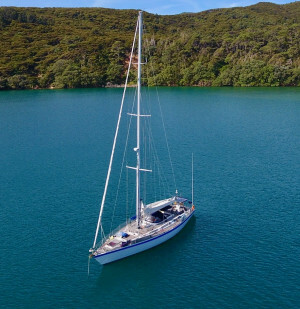 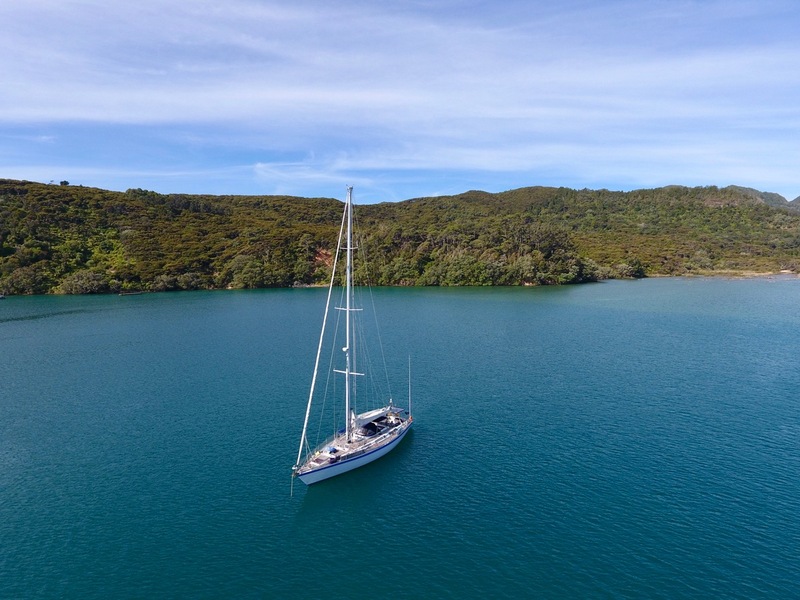 Its elegant 19m lines and soaring sloop rig and integral mast collar adds a sleek to the silhouette. 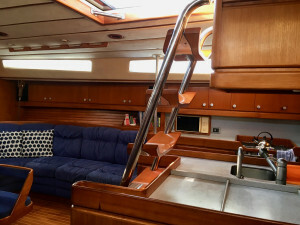 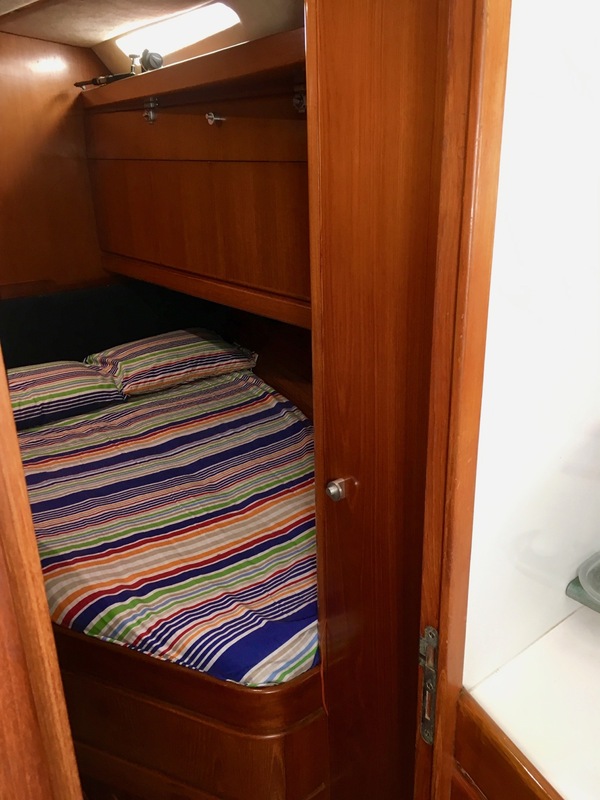 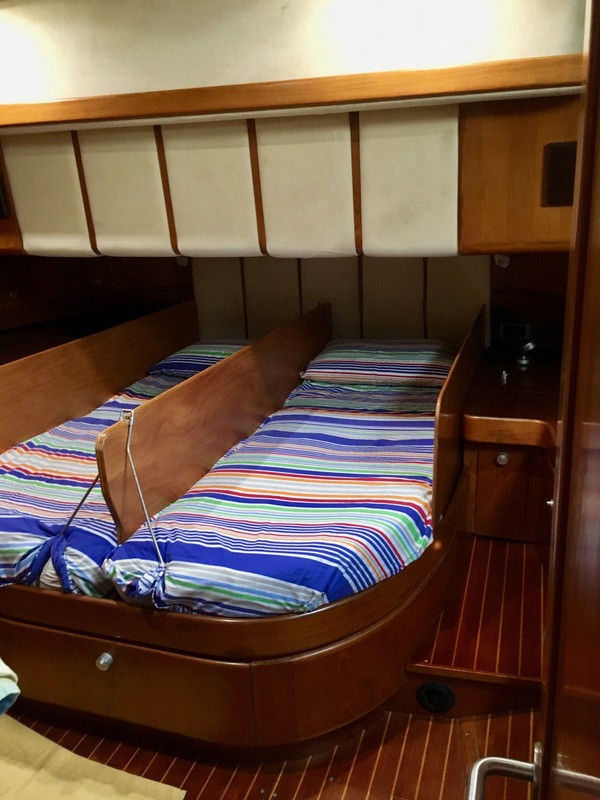 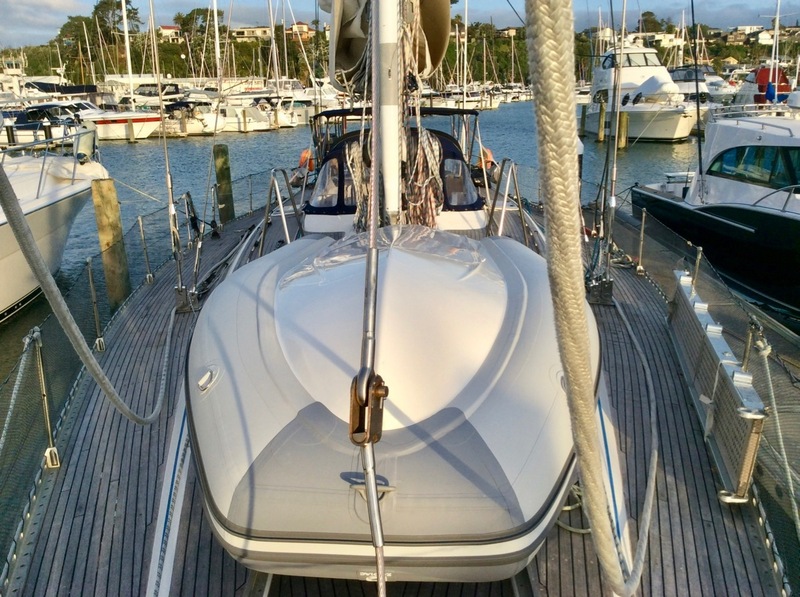 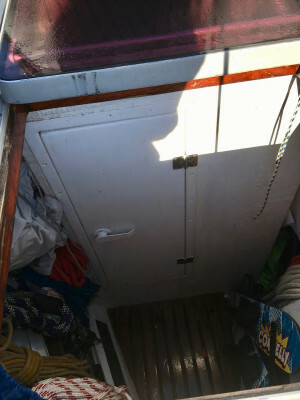 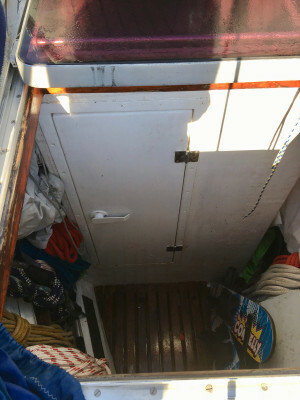 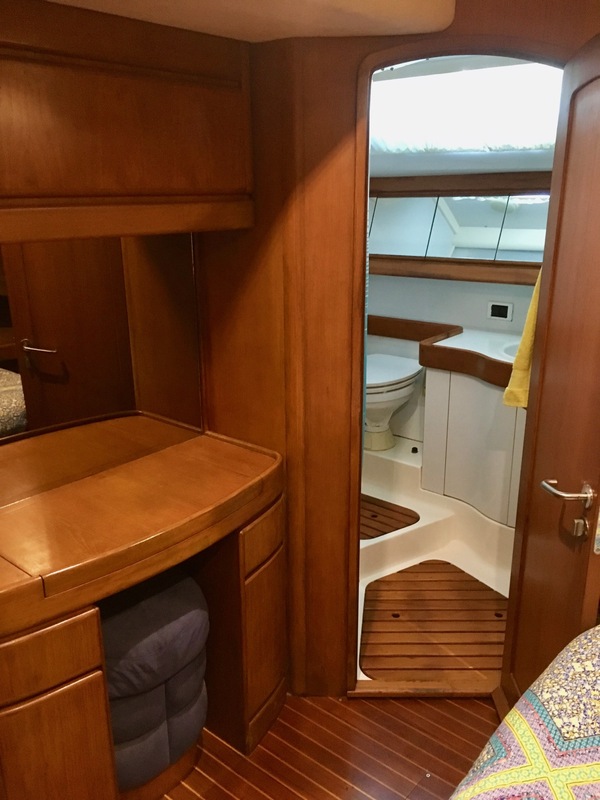 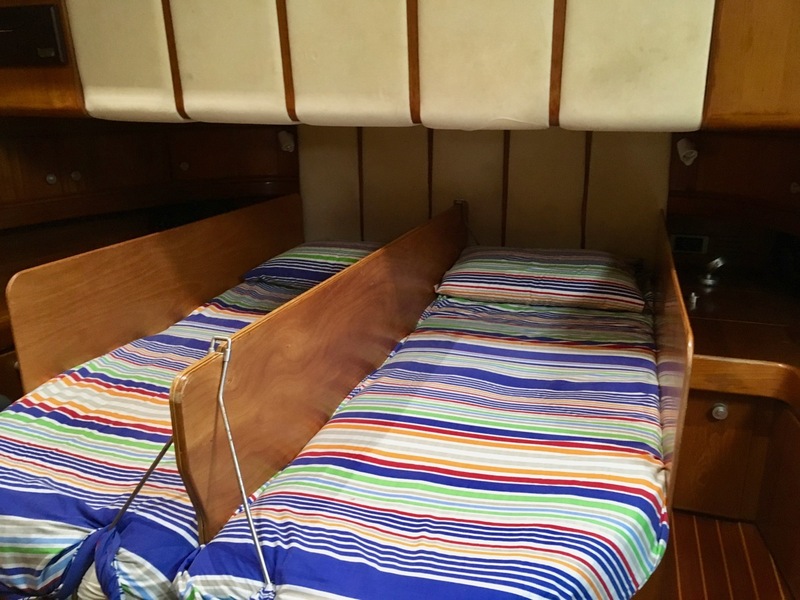 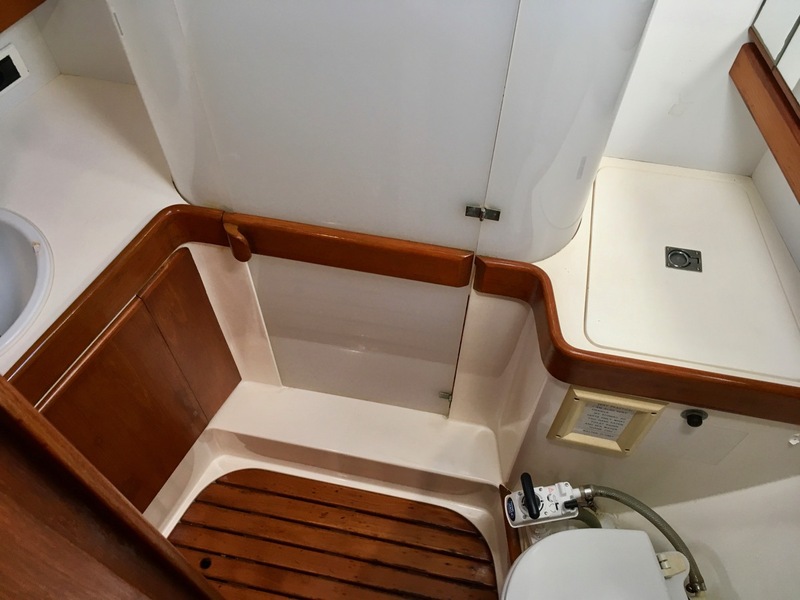 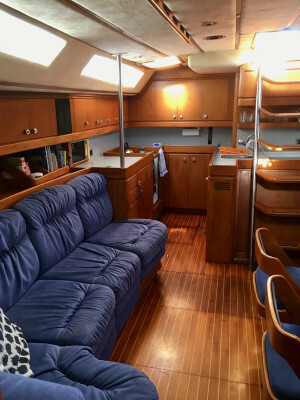 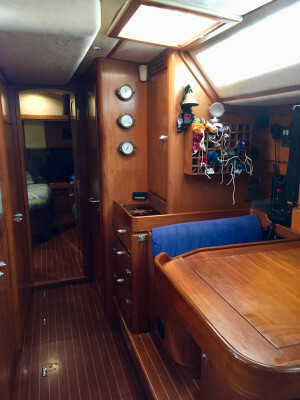 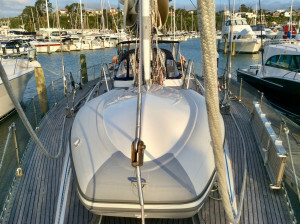 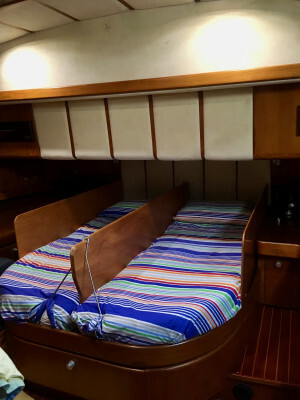 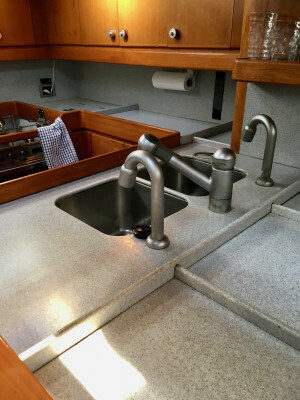 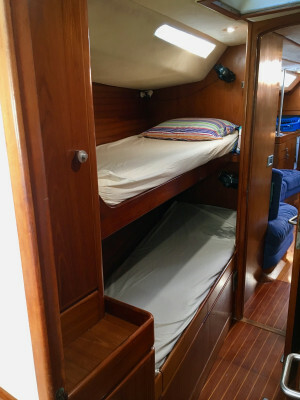 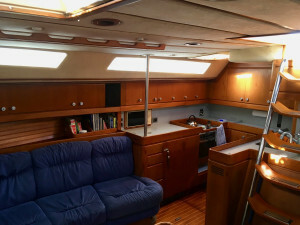 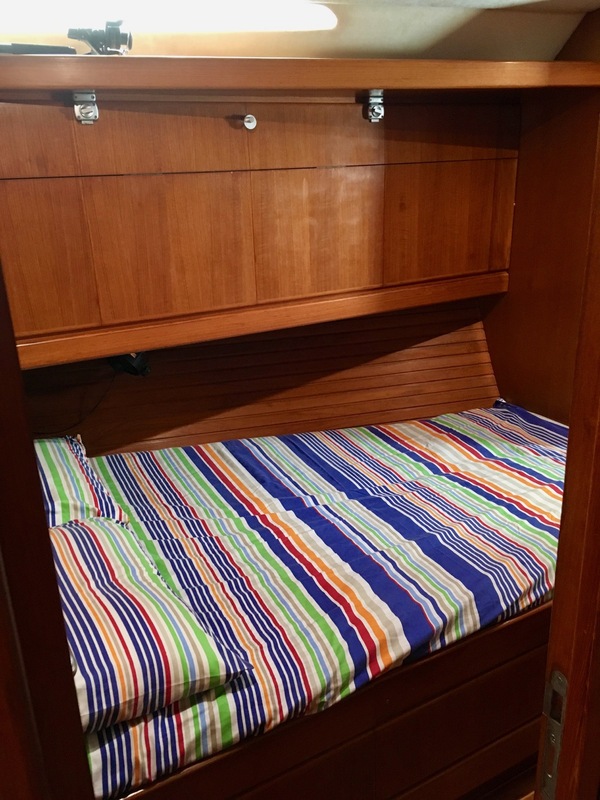 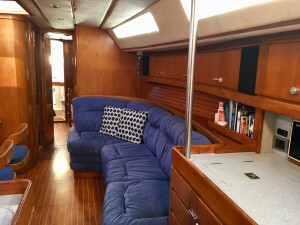 Fitted out for comfortable cruising the deck has a 12mm teak covering of the highest quality, unencumbered decks, and a generously proportioned companionway hatch that will draw the cooling air as well as provide comfortable access. 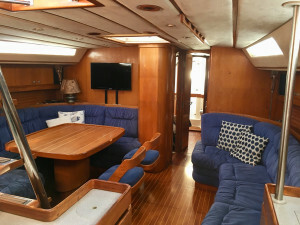 Inspired by super-yacht designs, the cockpit is split in two parts, with the skipper and crew’s located aft, with its large wheel, grinders and electronics, well away from main (center) cockpit or deck living area which is completely clear of sail-handling gear and beautifully appointed with large table and curving settees with upholstered cushions. 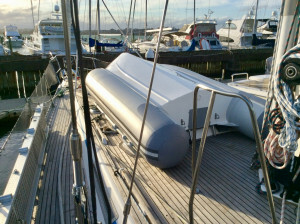 The area is protected with a collapsible spray dodger and fitted with lights and top quality marine speakers. 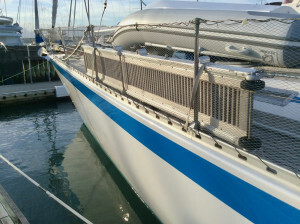 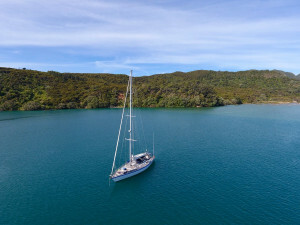 The deck layout was designed with performance in mind, with notable contribution from the renowned French ocean racer Loic Peyron for the design, sea-trials and selection of the deck gear. This has resulted in optimized performance together with easy handling plus reliable fittings and gear. 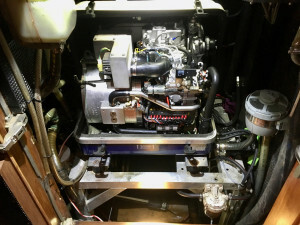 Two electric primary winches recently complemented the four oversized secondary winches. 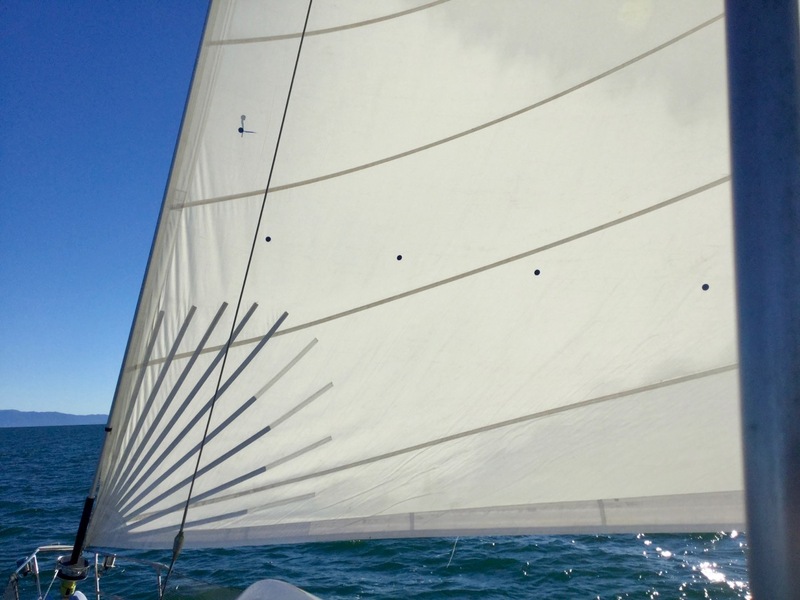 Titanium is used for the blocks, Kevlar for the runners – state of the art material used for their strength and shock resistance. 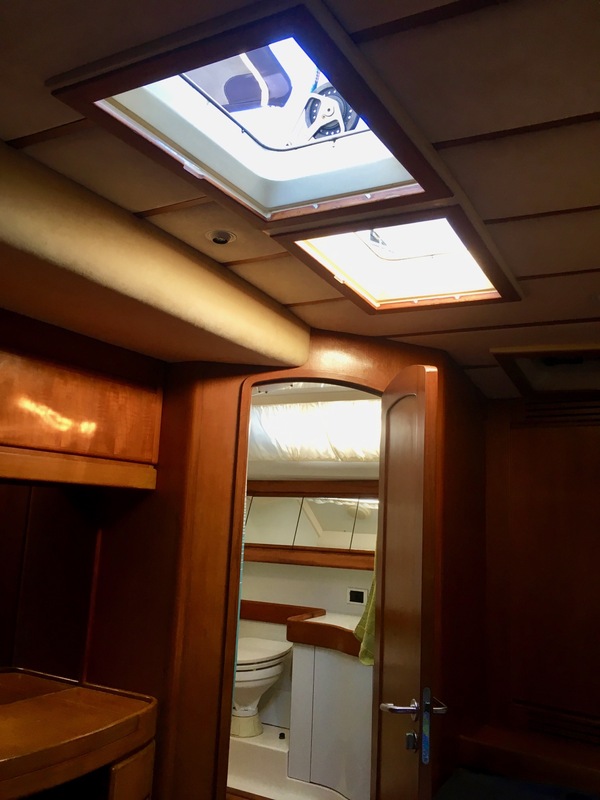 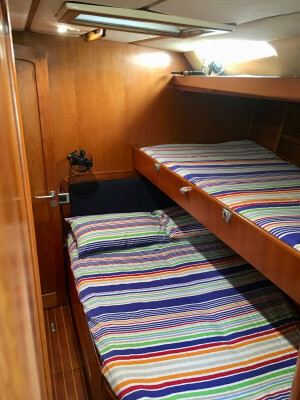 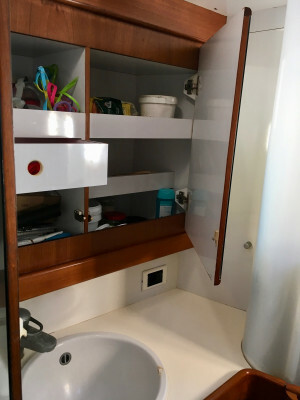 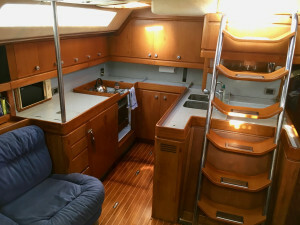 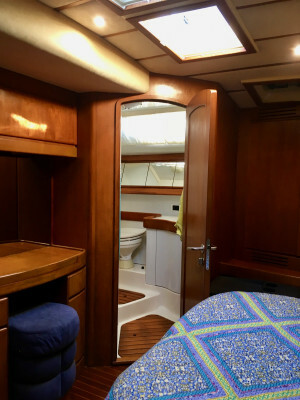 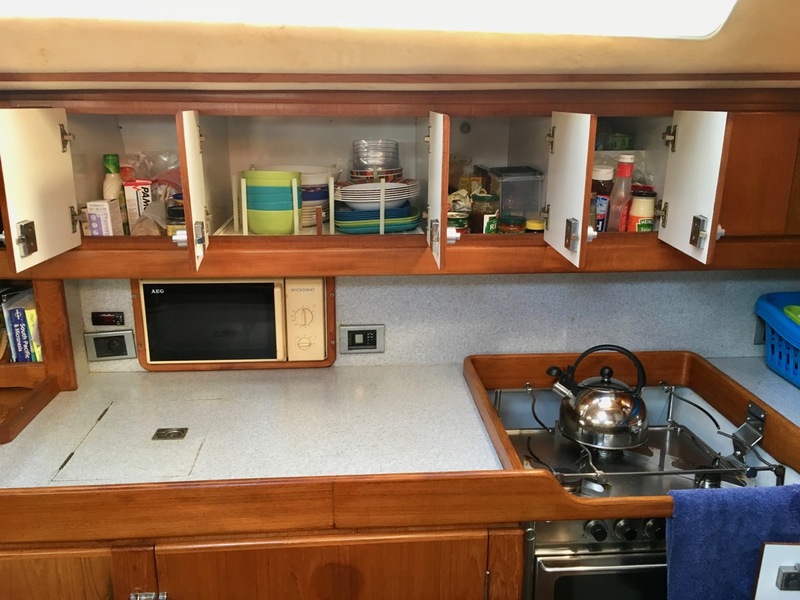 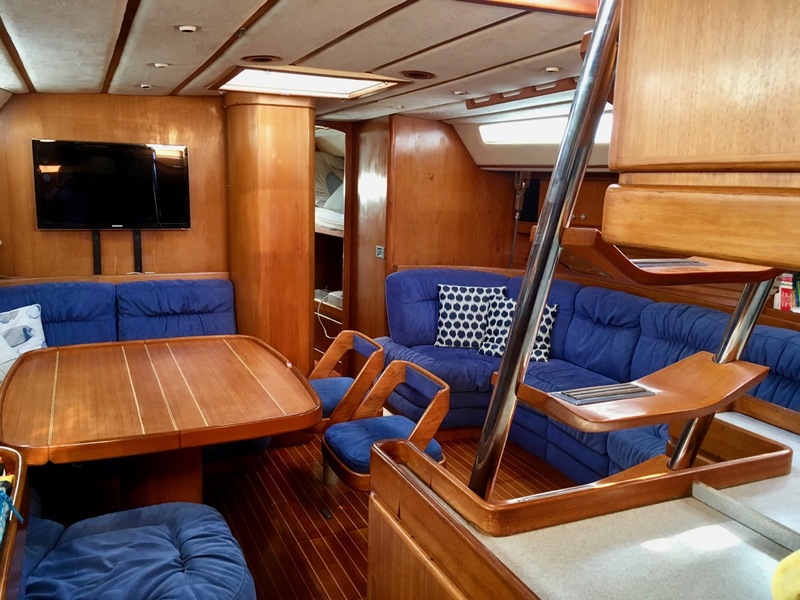 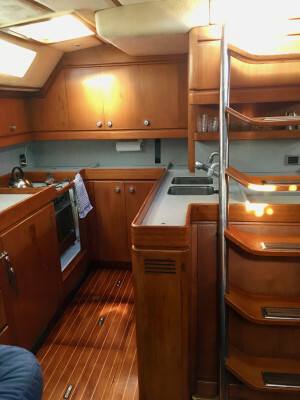 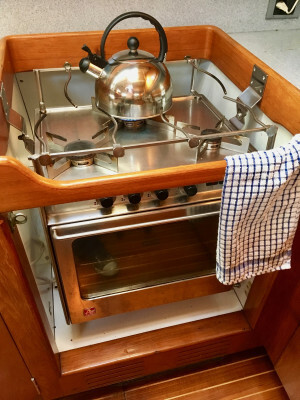 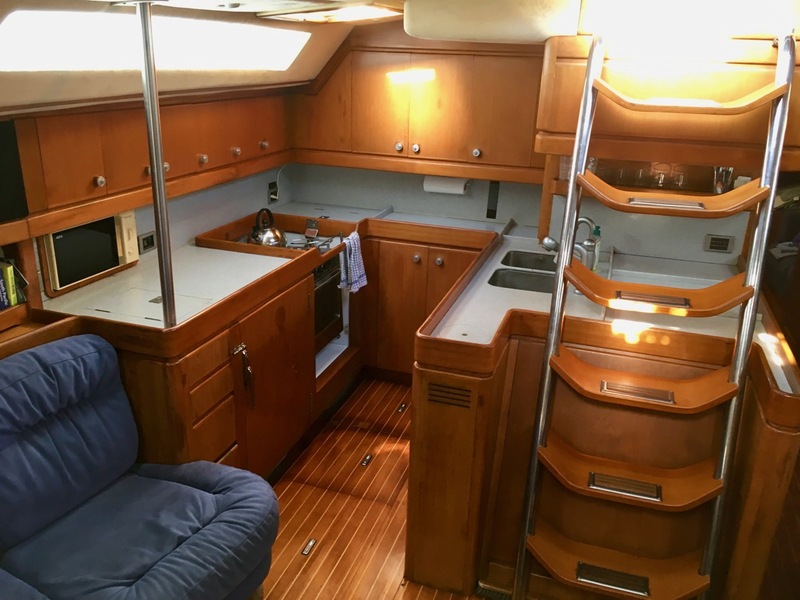 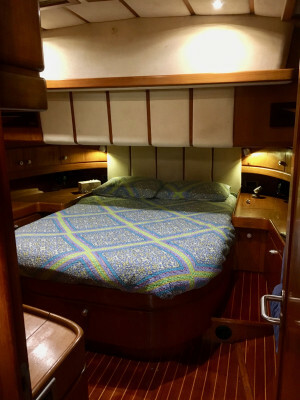 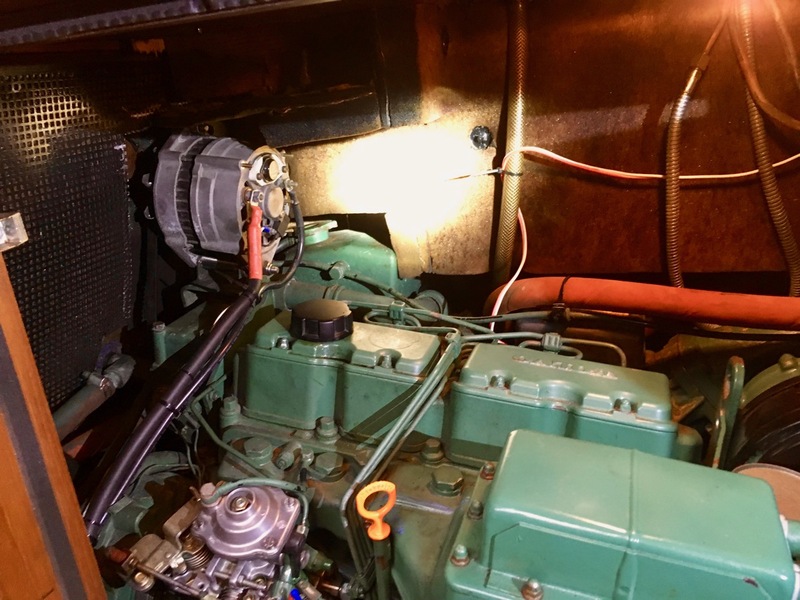 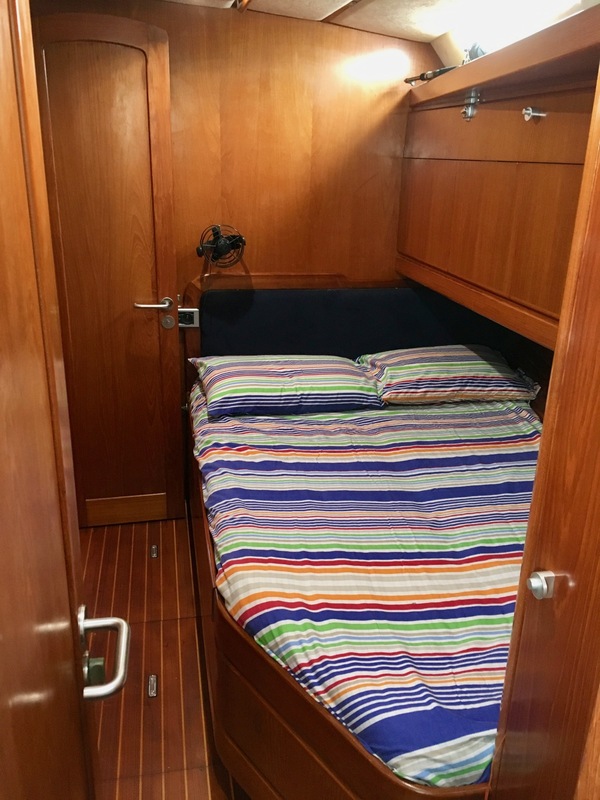 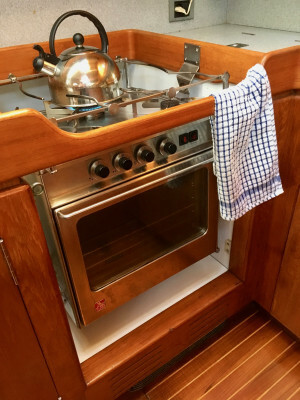 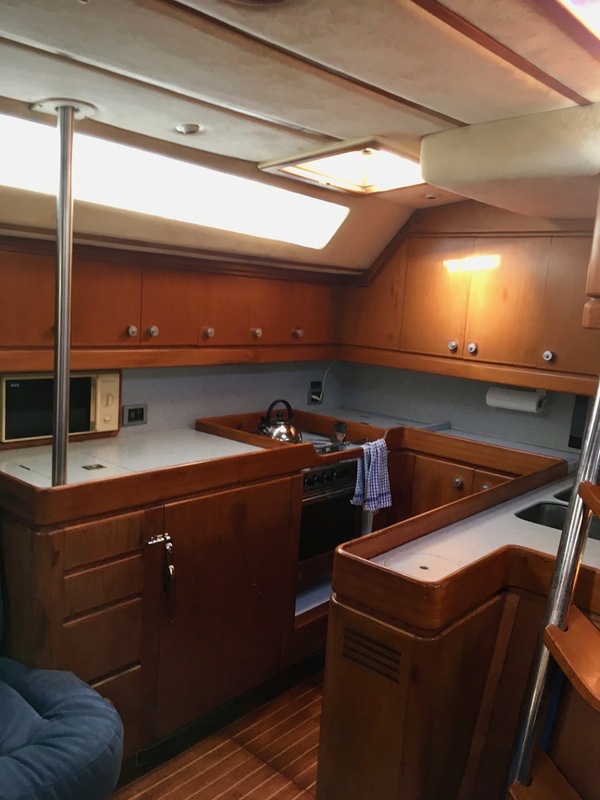 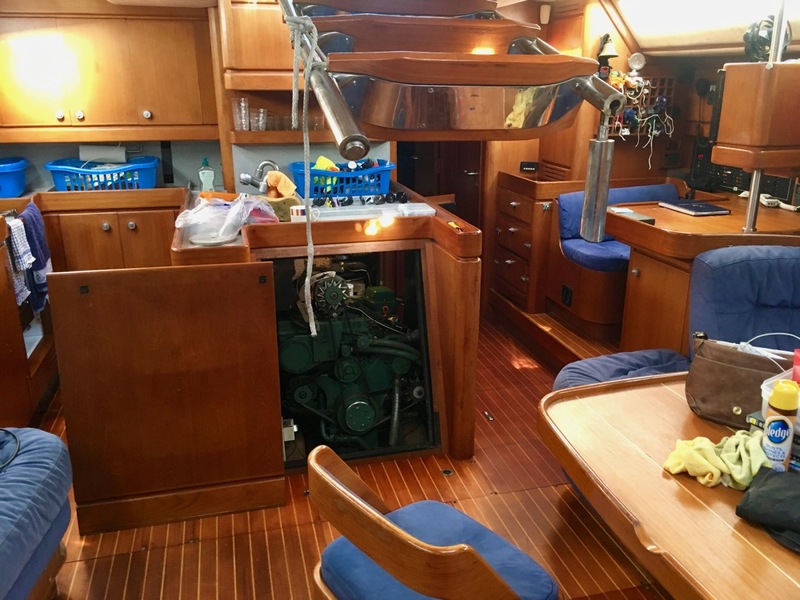 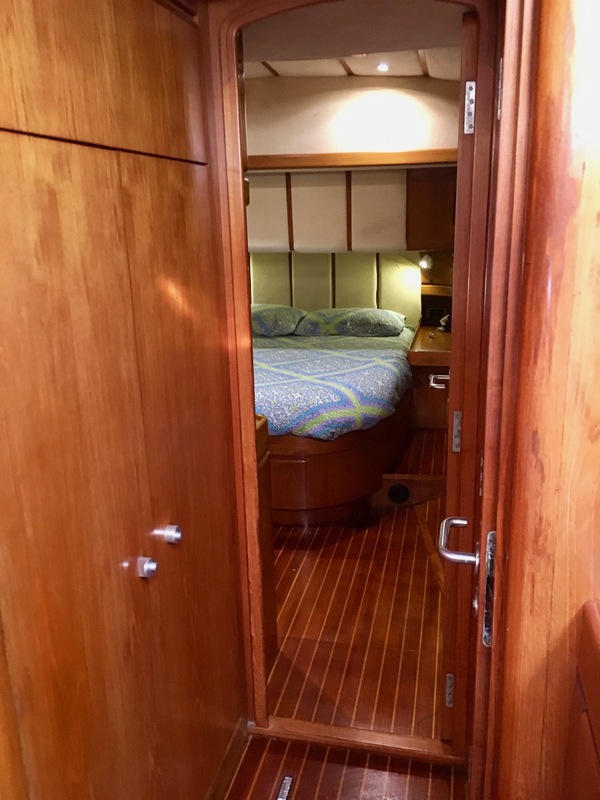 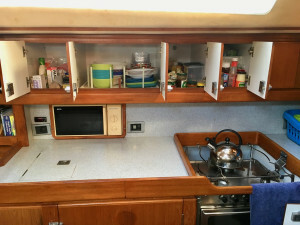 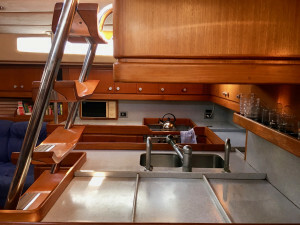 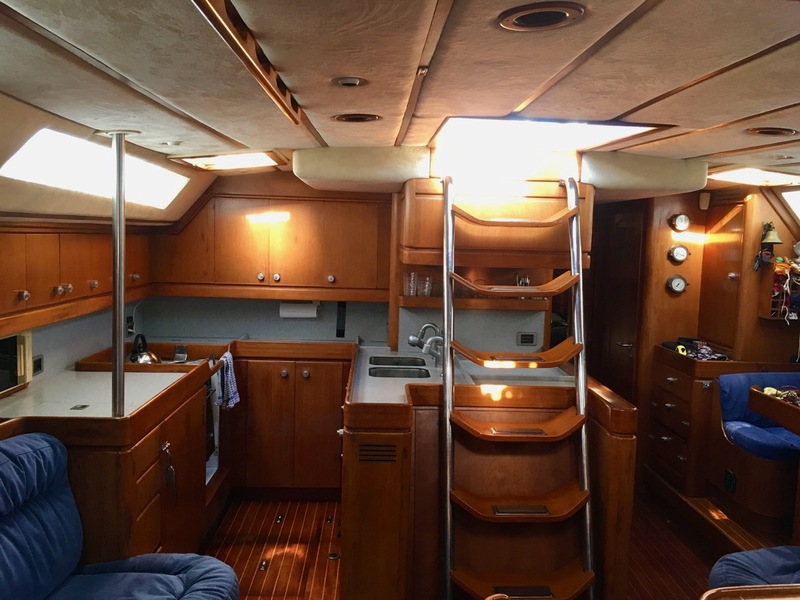 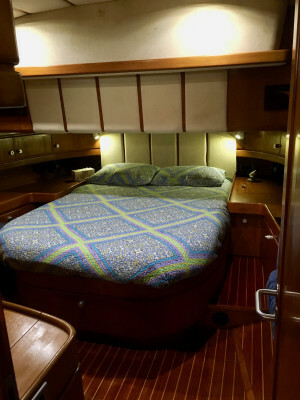 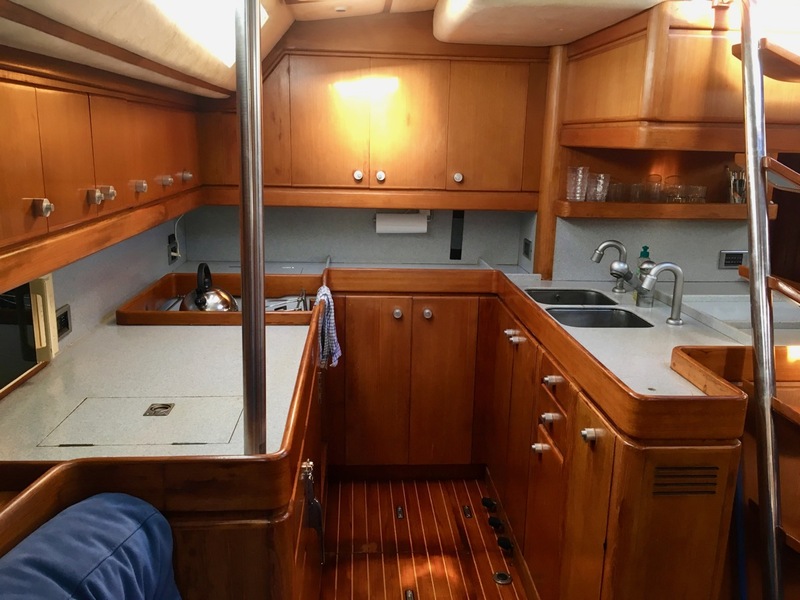 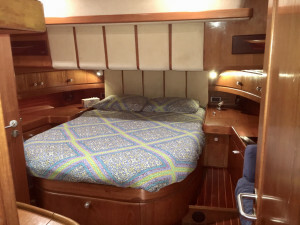 Below deck, the Andrew Winch designed interior is simply luxurious, with its variety of fine woods, Alcantara upholstery and state-of-the-art Hi-Fi system, huge gourmet galley with microwave oven, top quality marine stove and large capacity refrigeration. The comfortable and beautifully woodwork shows the quality of the workmanship in every detail, from curved corners to perfect joinery. 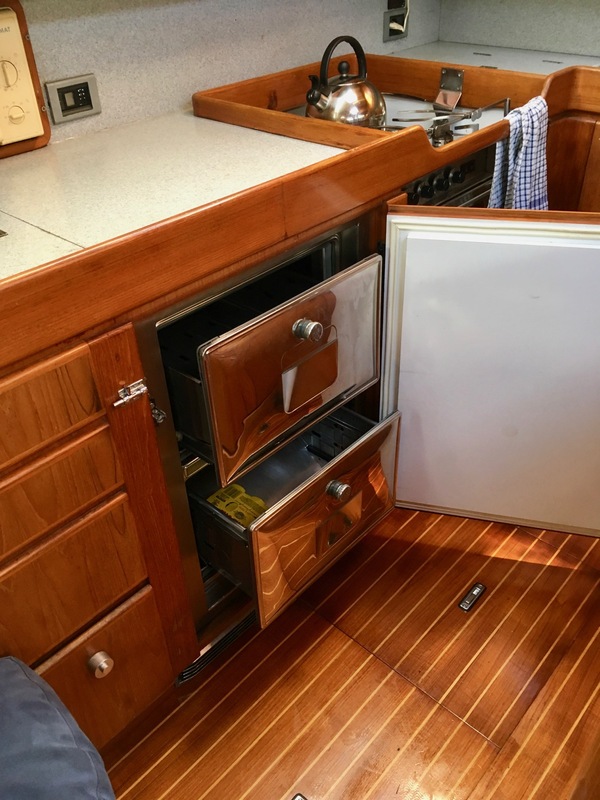 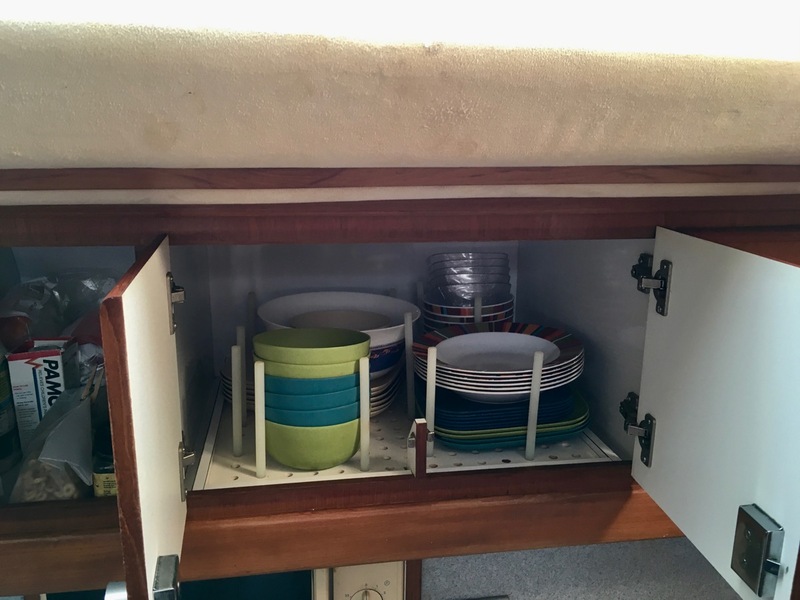 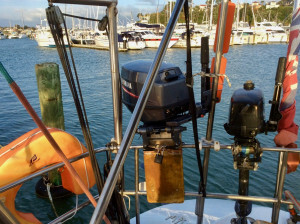 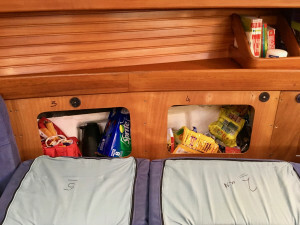 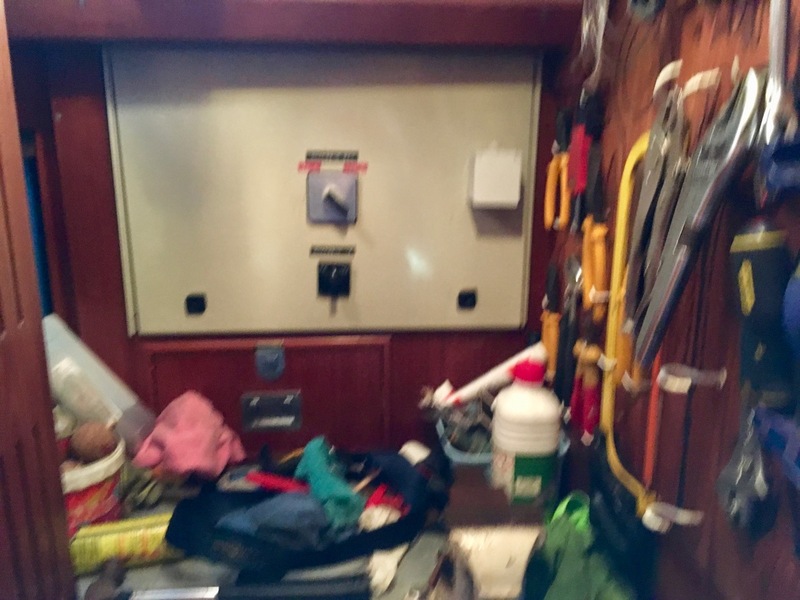 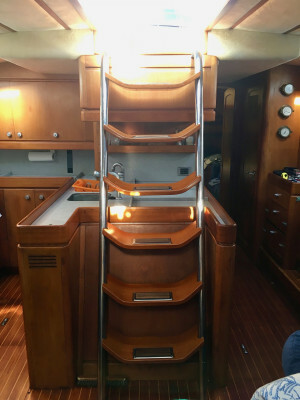 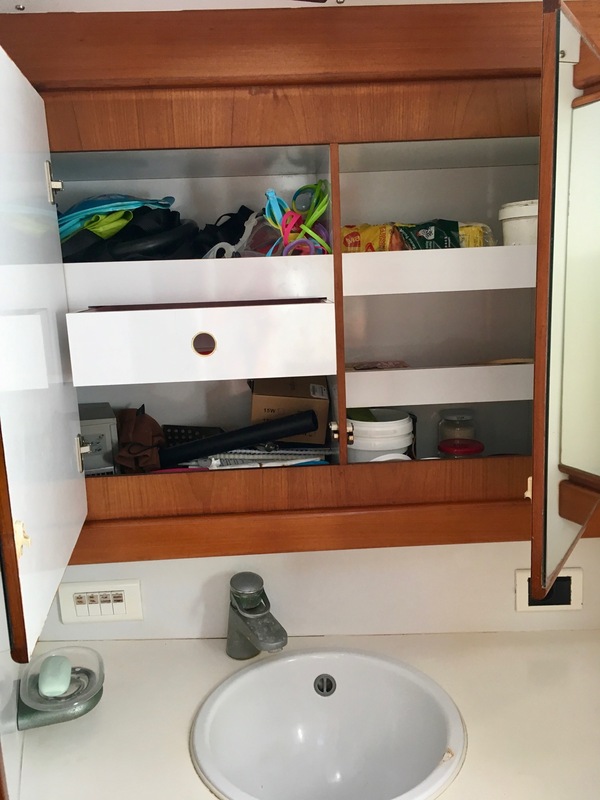 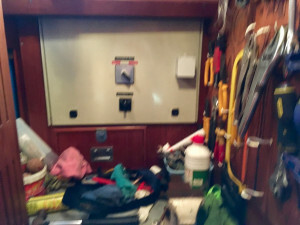 Storage is plentiful and intelligently designed for long-term live-aboard. 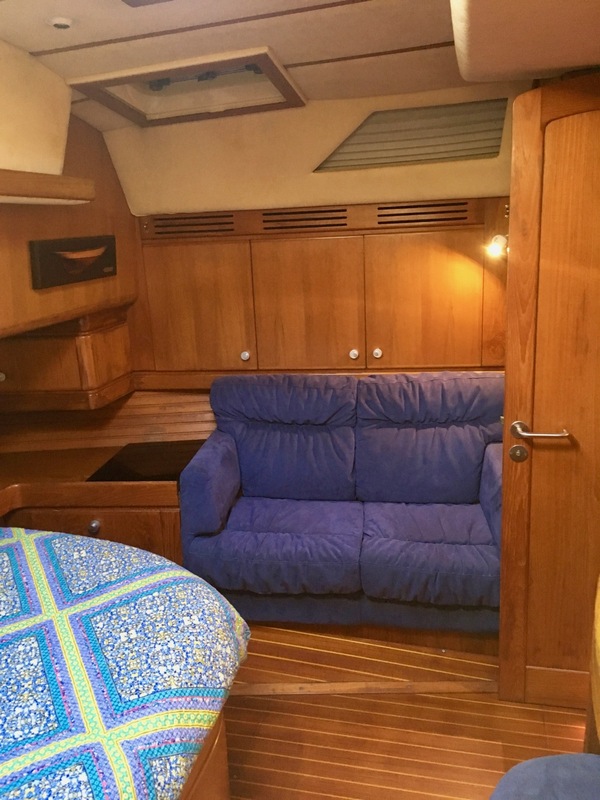 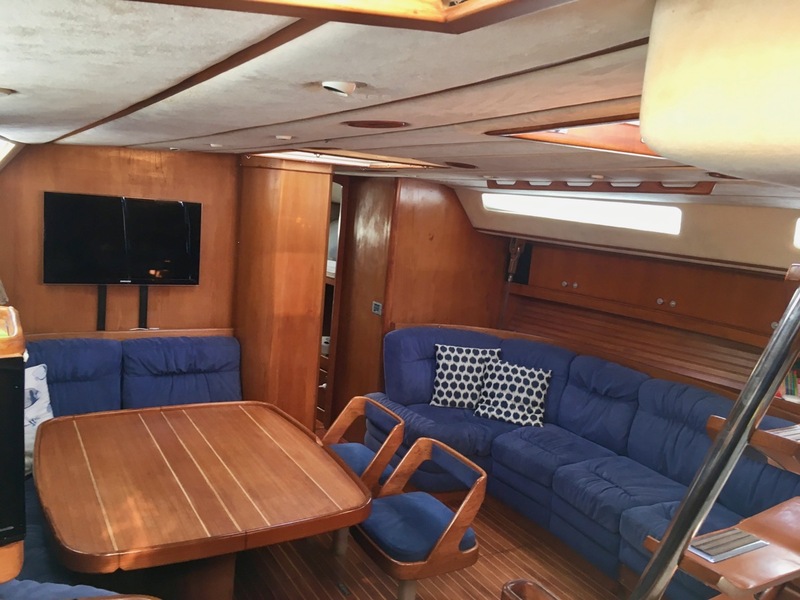 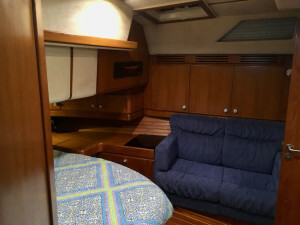 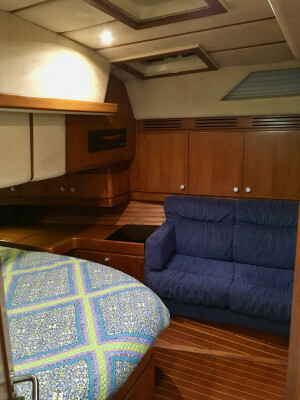 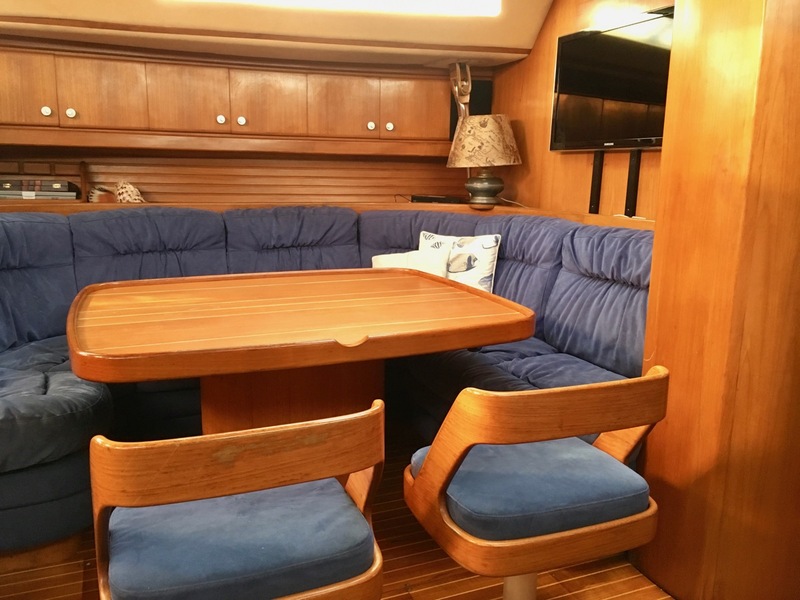 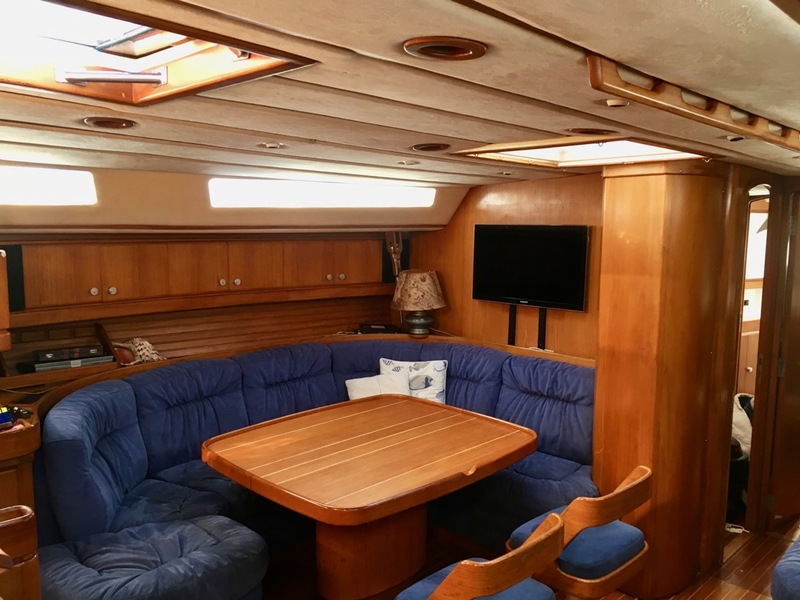 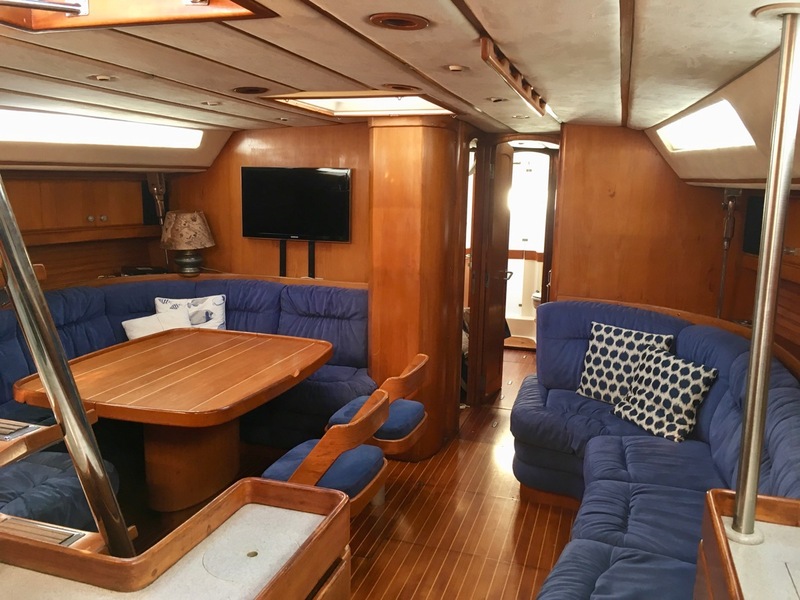 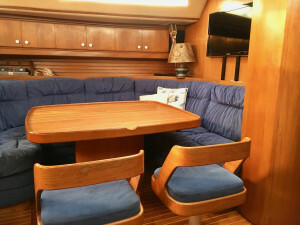 The saloon curved to one side around the beautiful timber table with plush upholstery, which is complemented with two full size lounges on the other side, which can be converted to quarter berths complete with lee-cloths. 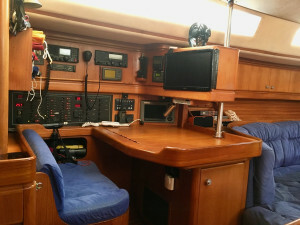 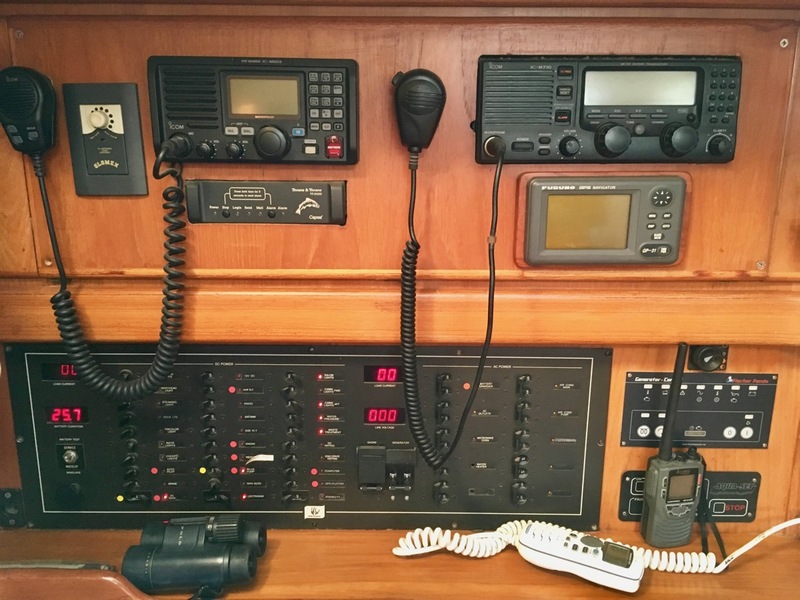 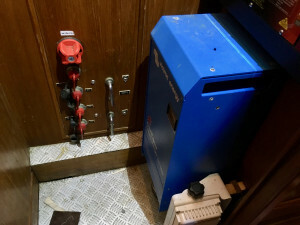 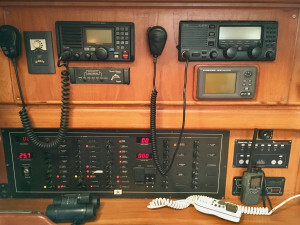 The large navigation table is perfectly set-up for keeping on track in comfort, with repeaters for all electronic systems and communication equipment. The Centurion 61S displays an internal layout blending space, comfort and function. 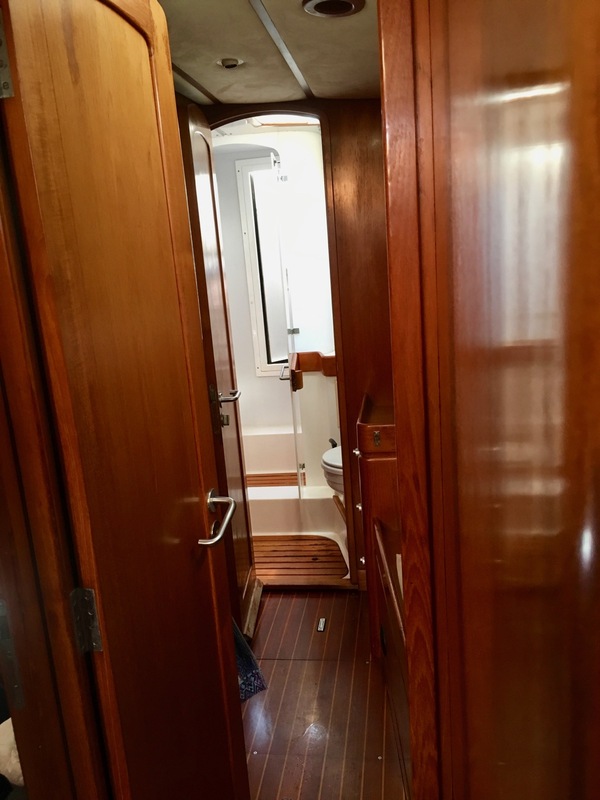 ‘Noce Sei’ is a Centurion 61S ‘Owner’s Version’, which has a suite aft, with a large double cabin and bathroom alongside, reserved for the owner. 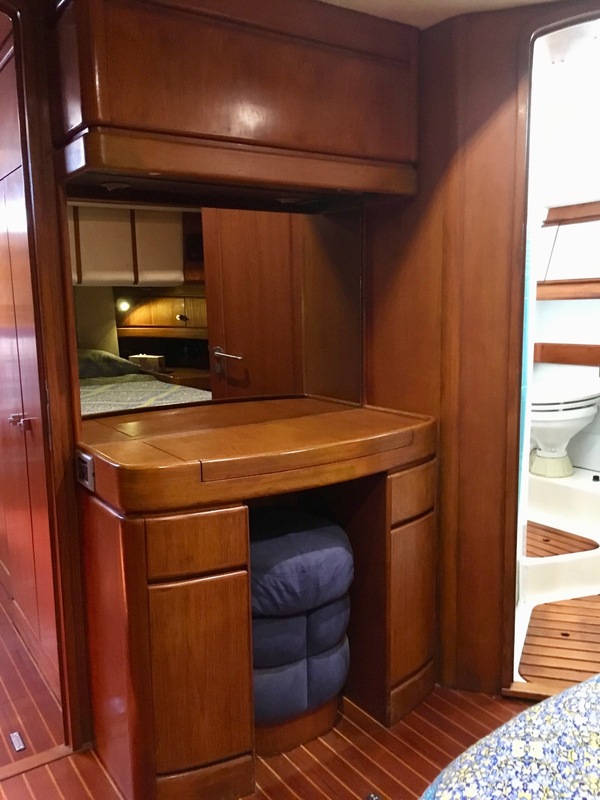 The island berth is perfectly elevated to provide ample storage without compromising on the headroom for sitting comfortable in bed. 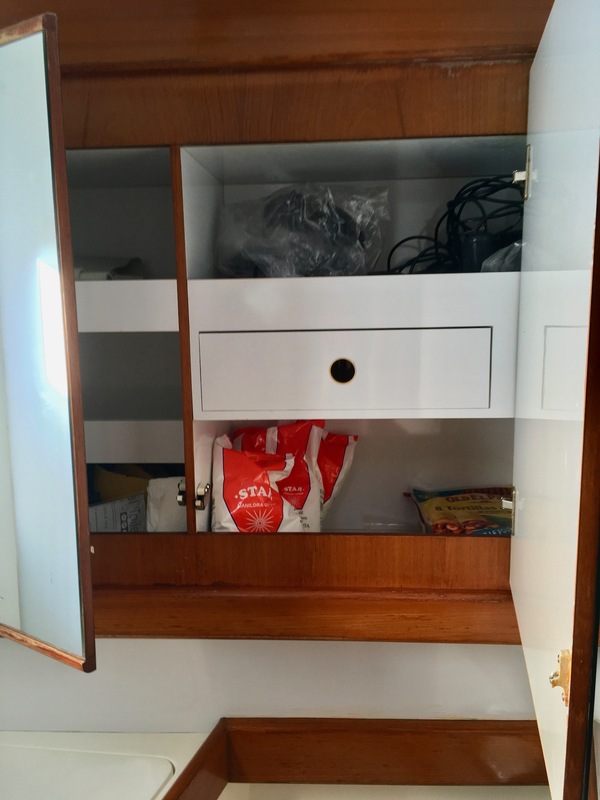 Dedicated cabinets and hanging lockers will ensure that there is room for an ample wardrobe, and there is plenty of natural light from the deck hatches and windows, which can be covered when darkness is preferred. The adjoining bathroom is generously proportioned, and fitted with an electric toilet and separate shower cubicle. 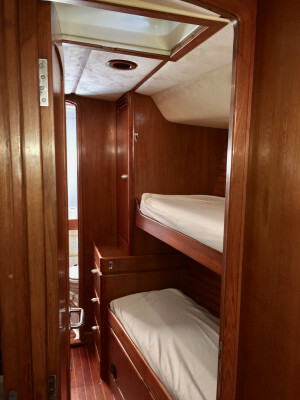 There are six more individual berths for the crew: A forward starboard cabin with upper and lower bunks: a forward port cabin with double berth and a single berth above that can be cleverly retracted, and two convertible berths in the main saloon. 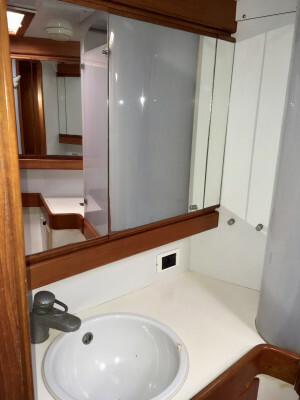 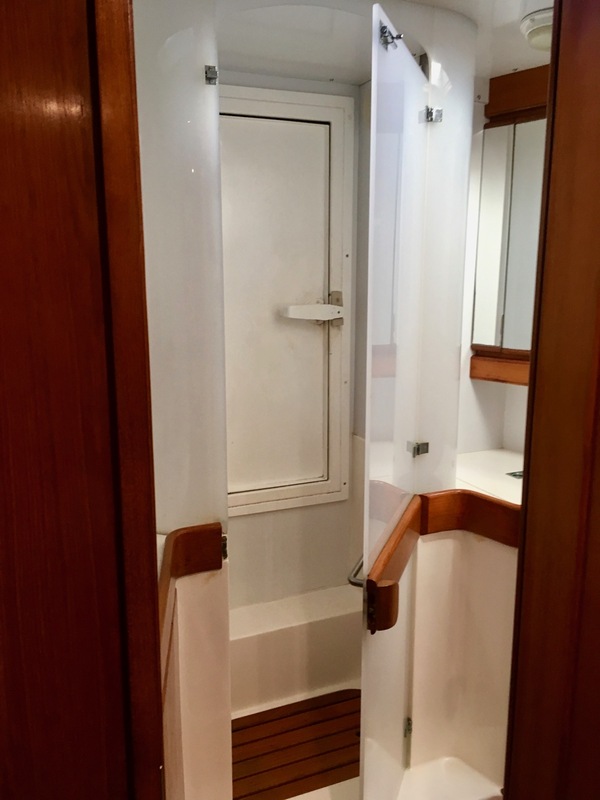 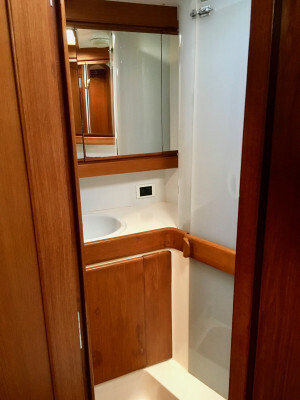 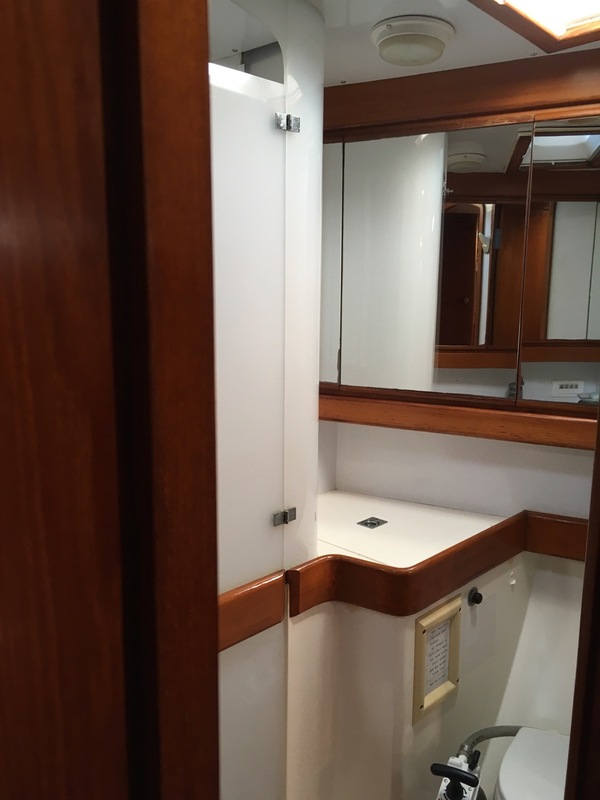 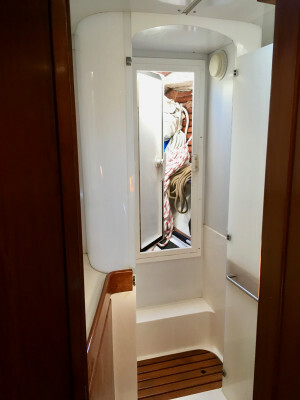 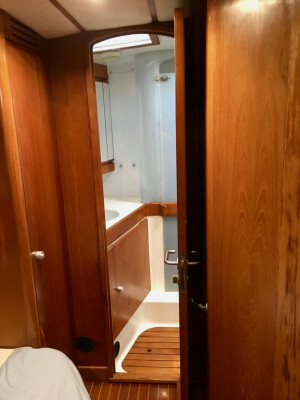 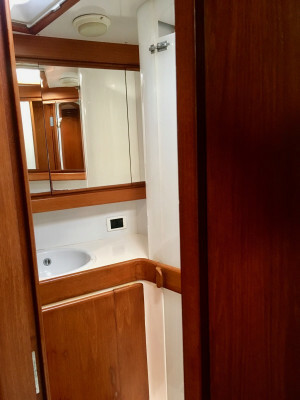 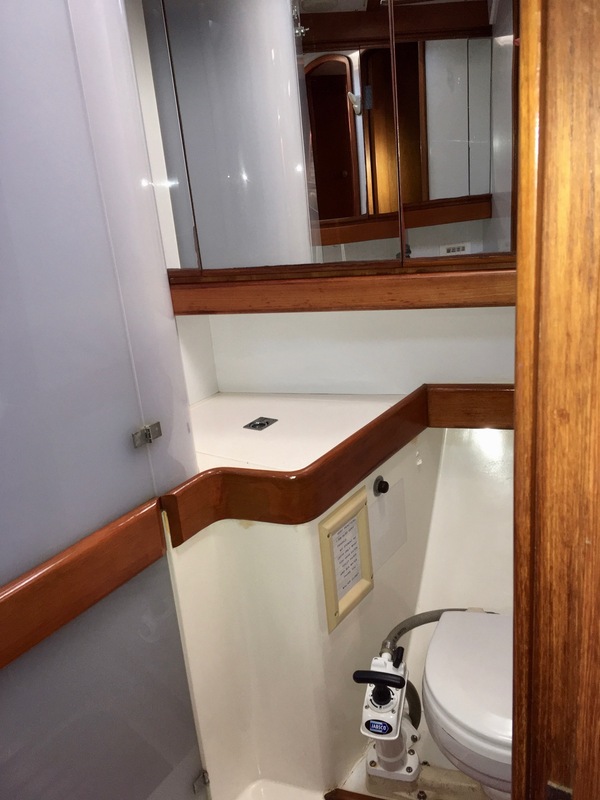 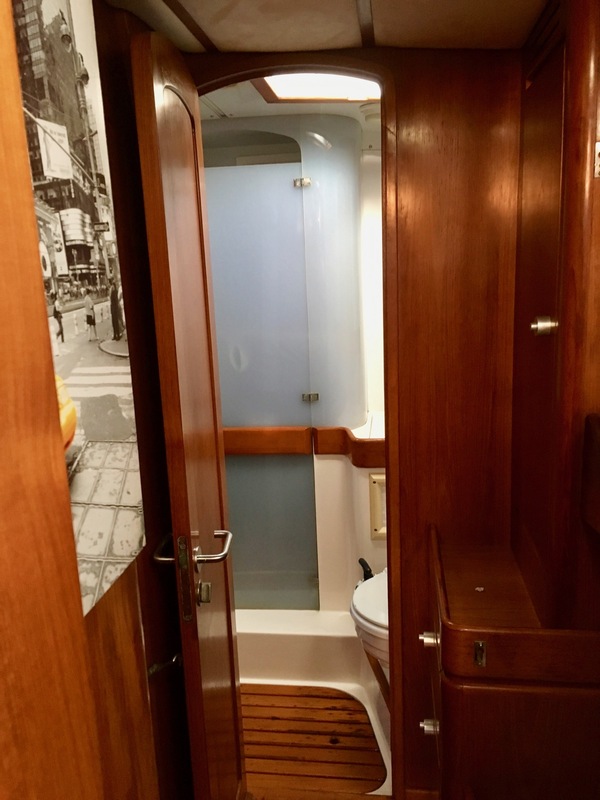 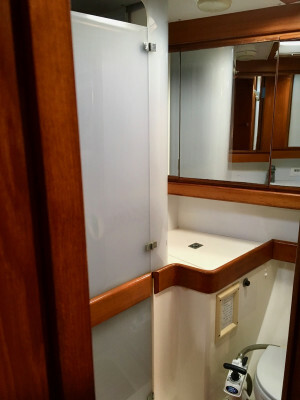 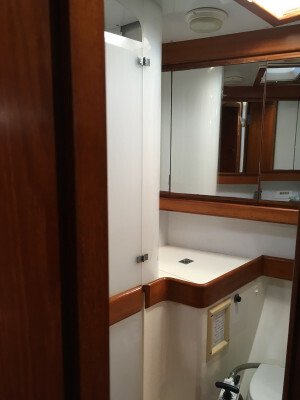 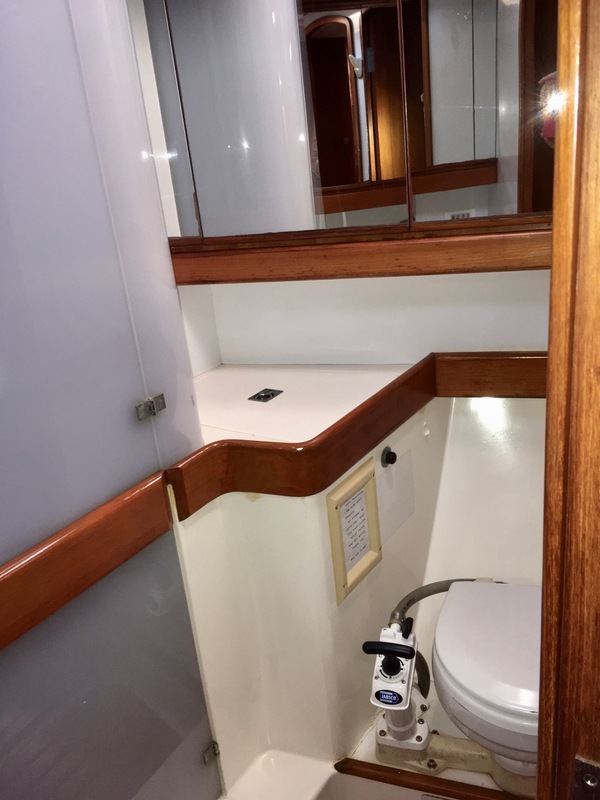 There is a guest bathroom with marine toilet and separate shower adjoining to the forward cabins. 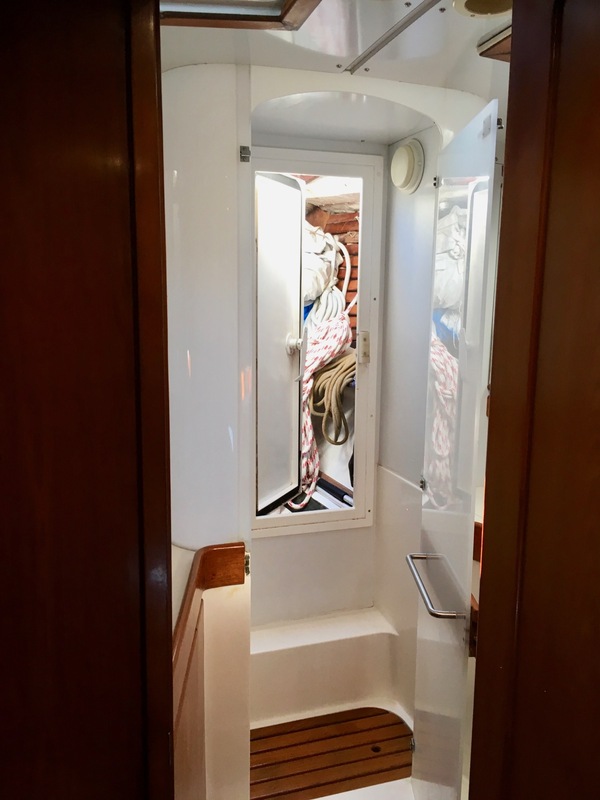 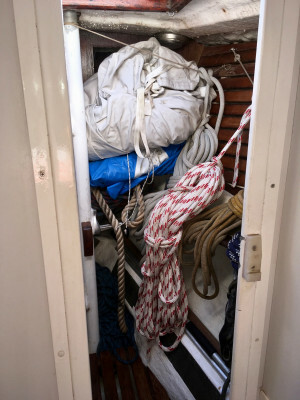 Two additional crew berths can be made available in the forward locker or wardroom. 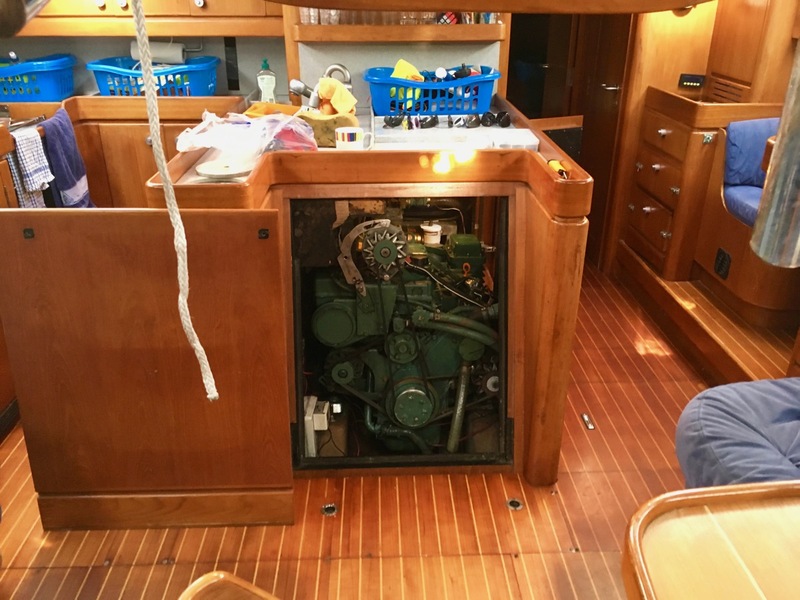 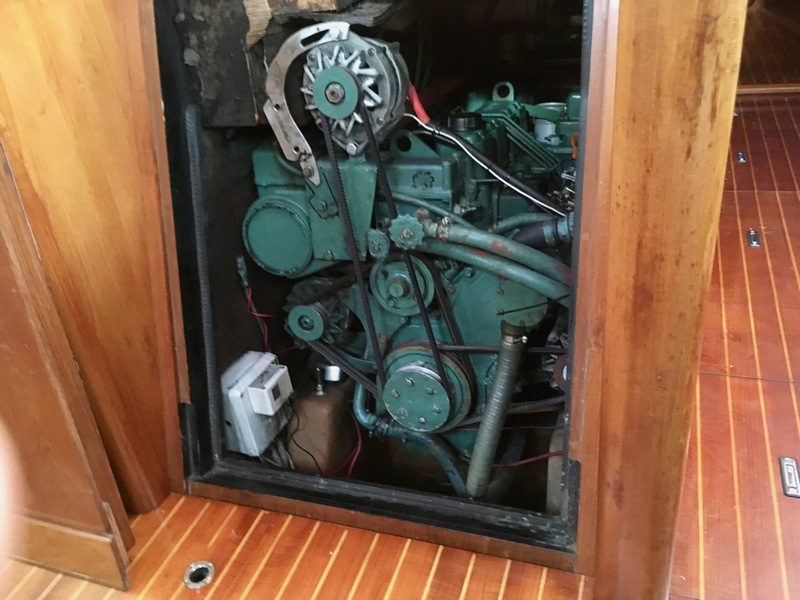 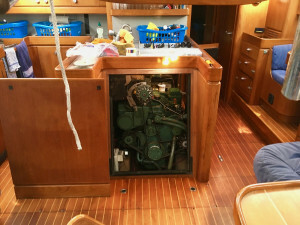 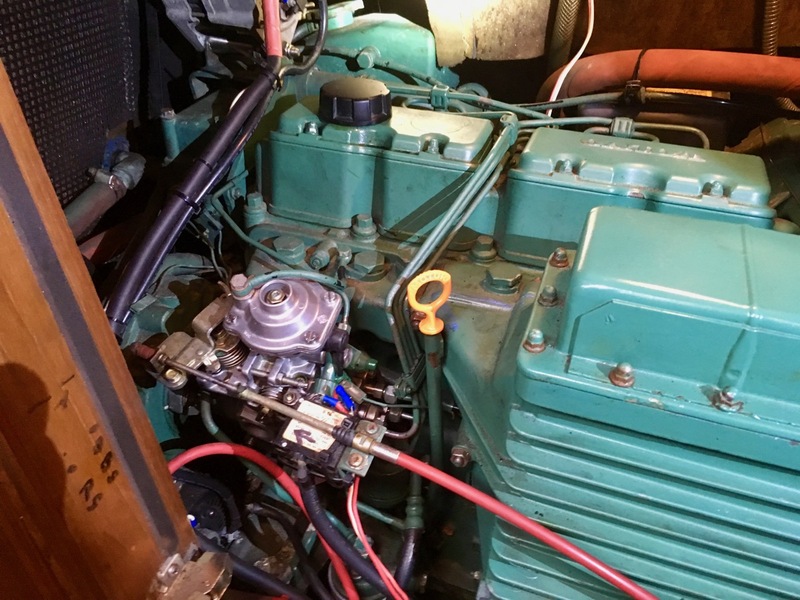 Complete strip down and rebuild - engine raw and fresh water side. 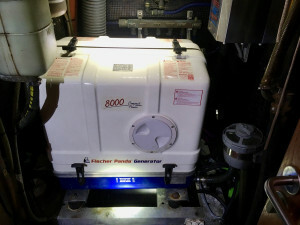 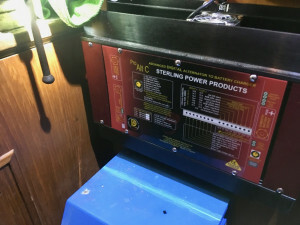 New Batteries - 500 Amp at 24 Volts - 180 Amp at 12 volts for engine and generator. 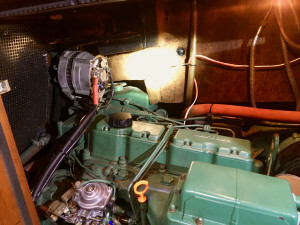 New water pumps with spares. 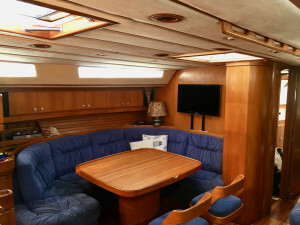 Price Base : REDUCED FOR QUICK SALE USD315,000 neg.